As a resident and former educator in the Shaw neighborhood of St. Louis, Darion Robinson is well versed on the educational needs of area schools. Last year, when learning of students’ alarmingly low scores on the state science exam, Robinson was motivated to take action. He hopes to spark collaboration between schools and generate interest in science, technology, engineering and math careers by implementing an after-school coding program for students. After graduating from the Neighborhood Leadership Academy, which is hosted at the University of Missouri–St. Louis, Robinson is ready to pitch his solo project to a partner organization and share with Shaw-area schools this fall. 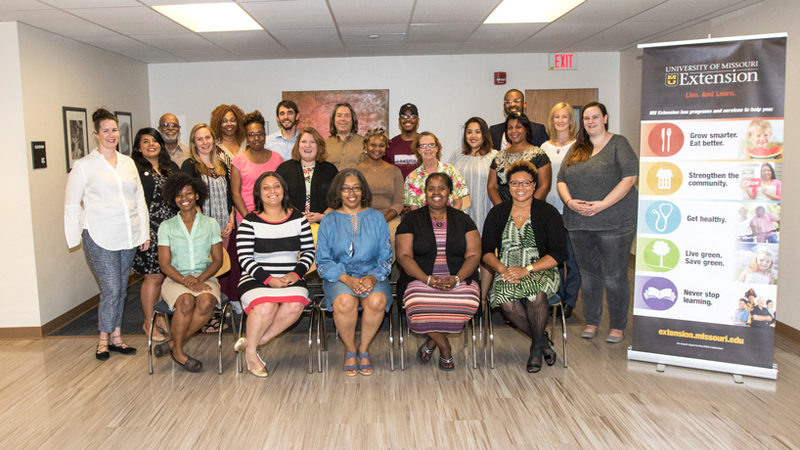 During the 10-session course, NLA connects UMSL resources – Creating Whole Communities and University of Missouri Extension – with residents throughout the metropolitan area who are interested in improving communities. NLA is offered yearly and has a network of more than 250 alumni, with participants earning a Chancellor’s Certificate from UMSL. Through the project-based curriculum, students develop a community improvement concept. At the conclusion of the course, they craft a three-minute pitch and written summary to present to funders, government officials or neighborhood associations. Co-facilitator Claire Wolff, who works alongside UMSL Assistant Professor of Social Work Kristen Wagner, believes the benefits of the comprehensive program are not only in the curriculum, but also in the unity of participants. While project ideas vary – from assisting low-income entrepreneurs to providing light bulbs to residents for strengthened home security – they share a common goal of building a better region. Robinson, who has ambitions to run for public office, said the program inspired and prepared him for future endeavors. Registration is still open for the fall Neighborhood Leadership Academy.